Enough teasers… let’s start with some details! … and then the girls, the parents and I hopped into a limo bus to meet the guys over at the park by Iwo Jima, where Adam and I got engaged, for our first look photos. After that the guys joined us on the limo bus and we all headed over to Glen Echo for the bridal party and immediate family shots. My brother and I in the limo on the way to Glen Echo. The wedding party, in between posing for photos. Oh, here’s as good a time as any to show you my bouquet in detail. For not caring much about the flowers, I am so glad I ended up going with a florist because I LOVED them. After photos, we went up into one of the classrooms for our ketubah signing. I am really glad we ended up having a ketubah, because it turns out in Maryland, the bride, groom and witnesses don’t even sign the marriage license! Being a lawyer, it just didn’t seem like a good idea to enter into a marriage contract without signing something. I love, love, love the text we chose, and we ended up with a gorgeous piece of original art as well. After the ketubah signing, we watched the guests arrive off the bus from our hiding spot in the classroom. It was then time to sneak out the back door, line up, and get to the main event! 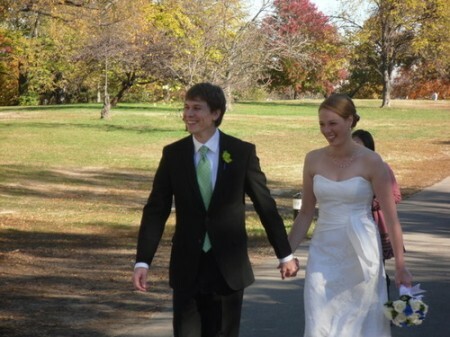 Our ceremony was performed by Adam’s good friend from college (who is now a good friend of mine as well). He was probably much more nervous than we were! He did an amazing job… I am so glad we chose someone we knew so well to perform the ceremony and I loved that our ceremony was really personal. It was serious, yet still light and funny. We even got our friends involved: we made the chuppah we stood under with our friends (who even came early to help set it up! ), we had Adam’s brother-in-law do a reading (“Union” by Robert Fulghum), and each member of the wedding party said one of the (non-religious) seven blessings we chose. Then there was glass breaking, and kissing, and turning around to see all our friends and family with the biggest, goofiest smiles ever on our faces! Immediately after the ceremony, there were lots of hugs and kisses going around with our immediate family and wedding party, before we were whisked away to a secret room for some alone time… complete with champagne and a plate full of hors d’oeuvres. After scarfing those down, we then went out for some extended family formal pictures and then for a few of just us now that we had made it official!